Last Thanksgiving, my husband and I took a quick trip to Washington, D.C. I had plans one morning to have breakfast at a certain restaurant that I had heard a lot about and had seen several times on The Food Network. However, our plans were foiled when we arrived at the restaurant and learned that since it was the day after Thanksgiving they weren’t opening at their normal schedule and instead wouldn’t open for another hour or so. Since we had a day packed with plans, we couldn’t wait around for them to open and we had to go eat elsewhere. That was unfortunate. 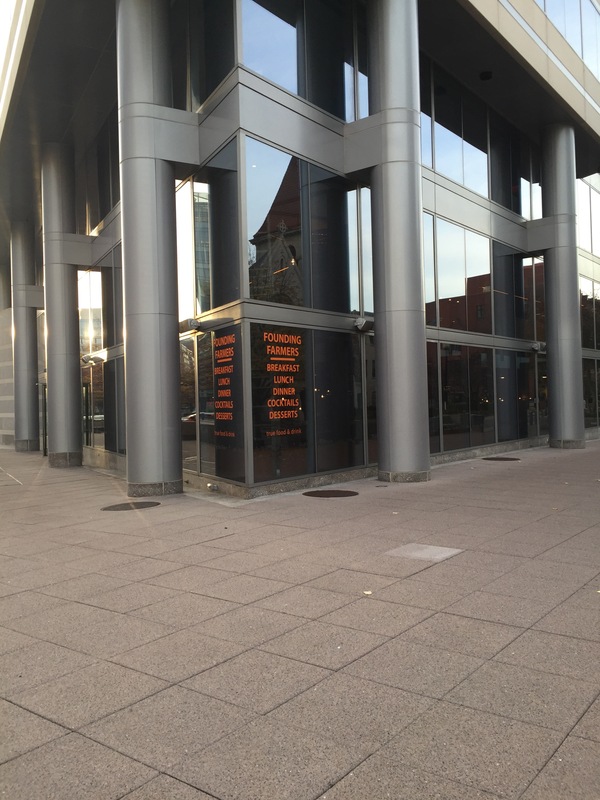 So when my husband and I made plans for a quick, one night, weekend trip to Washington, D.C., this year, I told my husband I we had to try and find a way to get back to that restaurant we missed out on last Thanksgiving, just so that we could say we dined there. The interior of the restaurant was buzzing. It was a Saturday night and it was busy. 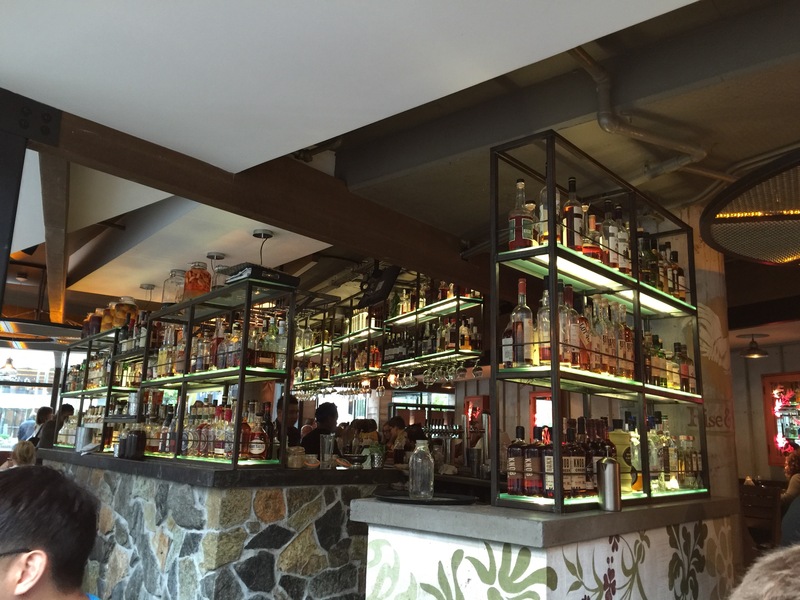 The restaurant is actually quite large inside and features a fully-stocked open bar that sits right in the middle of the space. The dining room is spread out over two levels. There are big farm tables that can be used in a communal style, or there are smaller more intimate tables for private dining. Regardless, each and every table inside the restaurant was filled. After a long night on a red eye flight, and a long day of sightseeing around Washington, D.C. during a rainy and wet day, we decided to treat ourselves to some drinks to start our meal. 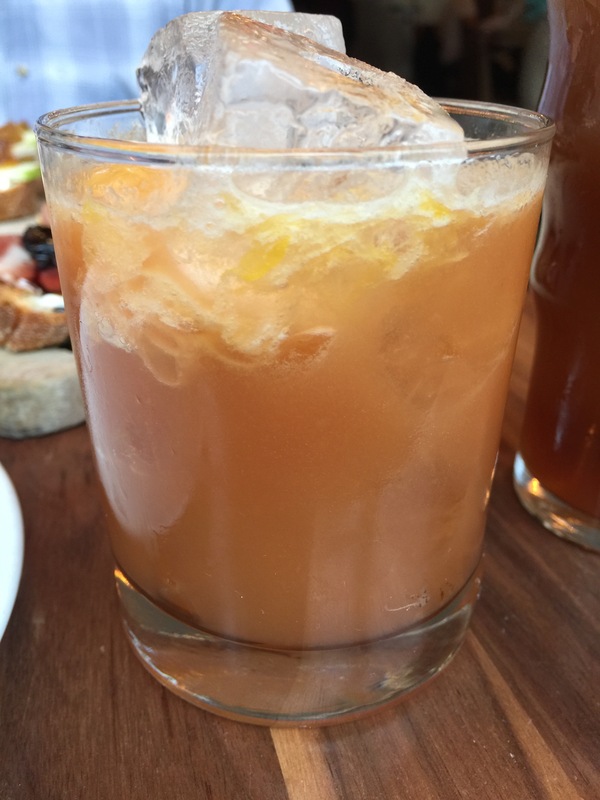 My husband ordered the Farmer’s Smash made with Founding Farmers rye, bitters, citrus and ginger syrup. My husband’s first impression was that the drink had way too much citrus in it. Citrus was the first thing we could smell when the drinks as brought to the table, and it was the most predominant flavor in the drink itself. And while my husband likes citrus, he thought it was way too much. However, after letting the drink sit and enjoying it with some of the food that started arriving at our table, he liked the drink better. Apparently, this Farmers Smash pairs better with food rather than just having the drink. My husband said that the biggest problem with this drink was that there just wasn’t any sort of a balance between the citrus flavors and the alcohol in the drink, so he was slightly disappointed. 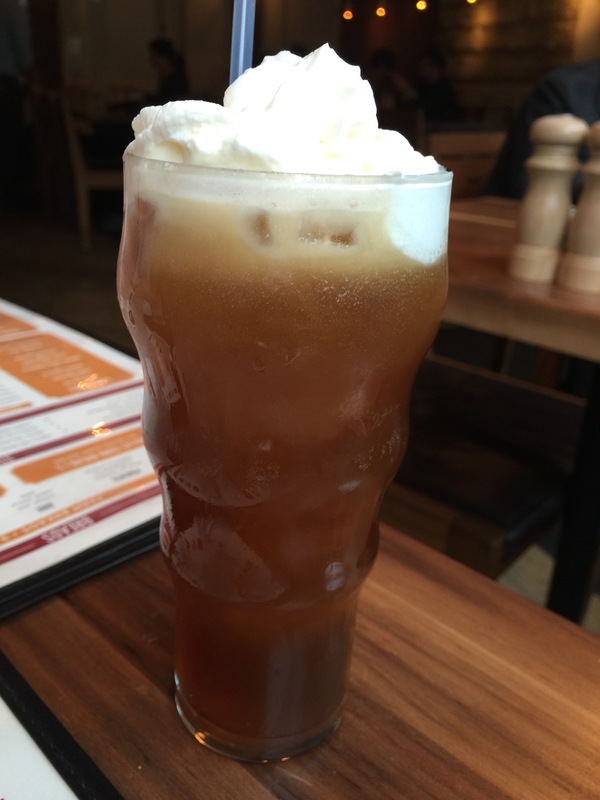 I decided to order the Manhattan soda, described as a mix of coffee, espresso, agave, jerk soda and all topped with whipped cream. Essentially, it was a strong coffee soda. The drink tasted of an iced coffee, but stronger and more powerful with the espresso. The sweetness from the agave was really nice, but the touch of jerk soda that added some carbonation to the coffee, while different, was really nice. I described the drink as being different but good. A drink that really invigorated, but also quenched my thirst. Definitely a drink I’d order again, if that’s any indication as to how good it was. As we had flown all night and really didn’t eat anything all day, I think we decided to go a little overboard with our meal and maybe our eyes were bigger than our stomachs. We saw something on the menu called Farm Breads. There were 5 different selection of Farm Breads, each made with different ingredients. Even after having asked the waiter what the Farm Breads were, we mistakenly assumed it was a small serving size, or at least a smaller portion than what it actually was. Since there were so many different types of Farm Breads to choose from, my husband and I each decided to pick one to order. When these massive breads were brought to our table, we realized we could have just done with one serving for the two of us, rather than 2 servings. Oh well, we were starving and they were good. Each Farm Bread is served on a wooden palette. On the serving board is three large pieces of fresh baked farm bread sliced and laid out to be topped by whatever ingredients we ordered. Mind you, each of the three pieces of bread was then chopped into 3 smaller, easier-to-eat pieces of bread. So, essentially, you got 9 bigger than bite-sized pieces of bread with each order. Yeah, one order definitely would have been enough for the two of us. 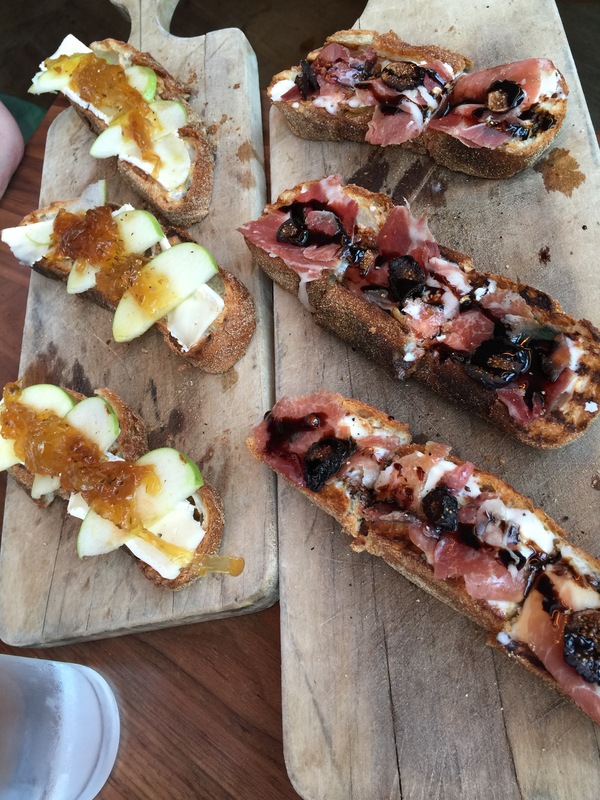 The first Farm Bread we received was the prosciutto with fig, mascarpone cheese and balsamic drizzle. This was my selection out of the 5 offerings. 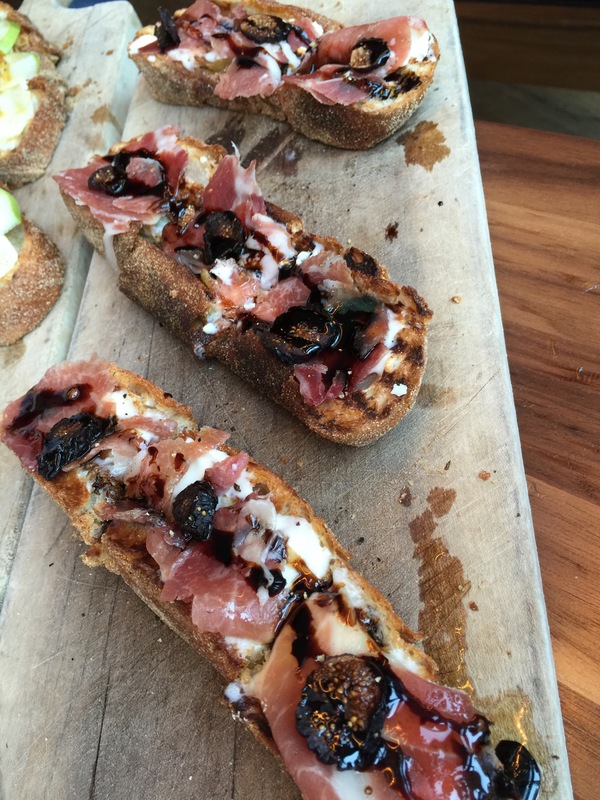 The pairing prosciutto and balsamic is just not one you can go wrong with, add a little hint of sweetness and creaminess with the mascarpone cheese, which was a great change of pace, plus the sweetness of dried figs, and this Farm Bread was a real winner. Both my husband and I thought that the mascarpone cheese was the true star of the dish. It tasted more like a light, airy whipped butter rather than mascarpone. The bread was perfectly crusty on the outside and tender on the inside and really delicious. And of course, the saltiness of the prosciutto and the tang of the balsamic was balanced by the sweet of the fig, which also added texture, and the sweetness of the mascarpone. I easily could have taken this Farm Bread as my entree and been perfectly happy. 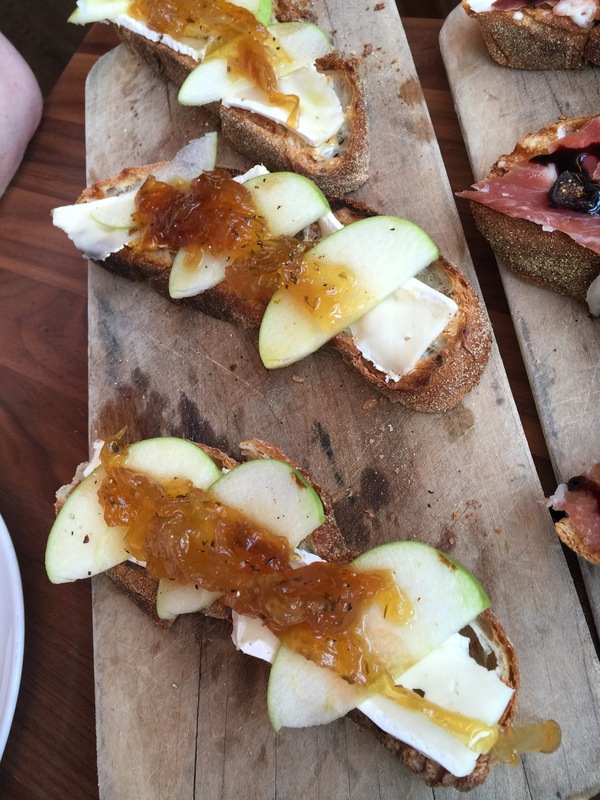 My husband chose the Farm Bread topped with brie, onion jam and crisp apple. Brie and apple have always been a great combination together as warm brie is slightly melty and stringy and has a flavor that pairs well with a tart crunchy apple. The onion jam was actually quite sweet and this Farm Bread almost tasted more like a dessert bread rather than a savory bread. For me, the crunch of the crisp apple was the star of the dish. The onion jam was a surprise as it was more like a morning jam or jelly you’d put on toast without any of the kick of the onion. Again, the bread itself was perfectly crusty and delicious and really easy to devour. I think my husband and I were both satisfied with our choices for Farm Bread. For dinner, my husband chose the sausage and mushroom gnocci. Served in an amazing broth and a side of toasted, homemade bread, this handmade gnocci was such a winner for my husband. The broth was incredibly rich, and incredibly flavorful, but it was also the best part of the dish. The handmade gnocchi was perfectly cooked and incredibly filling. 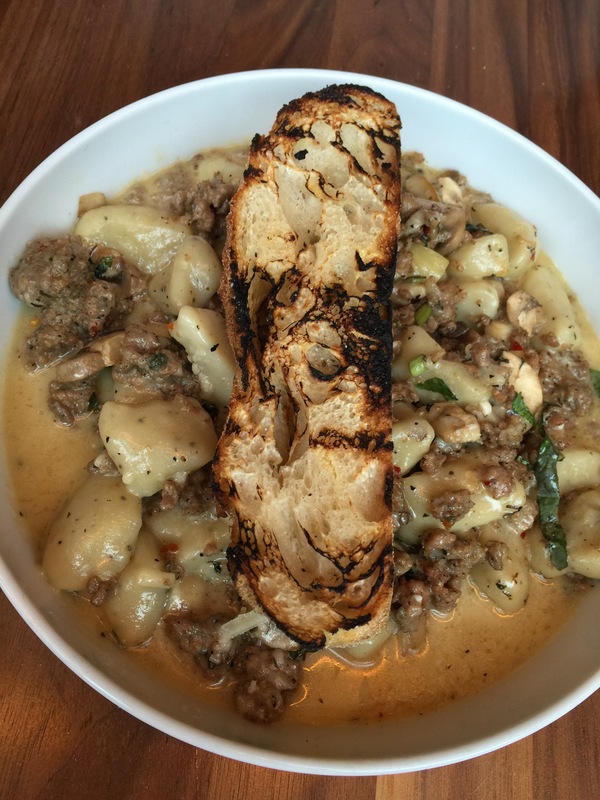 The flavors of the sausage and the mushroom blended together seamlessly and the slice of toasted crusty bread was a perfect accompaniment to the dish to help sop up all of the delicious brother. My husband loved the earthy rich flavor of the mushrooms combined with the herbs used to make the broth. My husband couldn’t believe how incredibly filling this dish and this was exactly the kind of comforting dish he needed after the kind of day we had. The flavors of a nice home cooked meal to fill the belly. 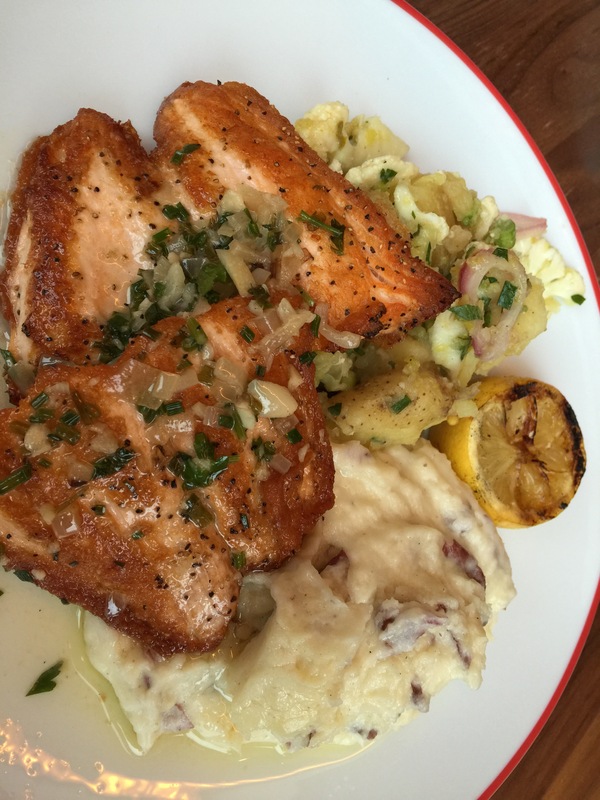 I chose to order the arctic char meuniere style with butter, shallots, and garlic lemon. The dish came with two sides, for which I chose red potatoes double-whipped and potato salad with pickled veggies. This is such a small thing, but I loved the grilled lemon that came as a side to the dish. The flavors that the grilling of the lemon brought out of the lemon when squeezed over the grilled fish was amazing. The grilled arctic char was perfectly cooked, with the fish being incredibly flavorful and flaky, crispy on the outside and tender on the inside. The meuniere sauce with the butter, shallots and garlic lemon that was poured over the arctic char filets was fantastic and flavorful as well. The sweetness and richness of the sauce brought out the wonderful flavor of the char. The mashed red potatoes were nice and creamy and delicious and filling. By this point, I was full, so I only had a couple of bites of the potato salad, but loved the picked flavor of the veggies, which was a nice change of flavor and texture from the double whipped potatoes and a good contrast to the fish itself. Ok, granted, we hadn’t eaten all day up until this point and we were starving, the food we had was so filling and we were so full, we figured we wouldn’t be able to handle dessert. Of course, we couldn’t say no to looking at the dessert menu, and somehow even though we were both stuffed, we each chose to order our own dessert? Yeah, not the world’s smartest decision, but we couldn’t seem to resist. No one ever called us geniuses. 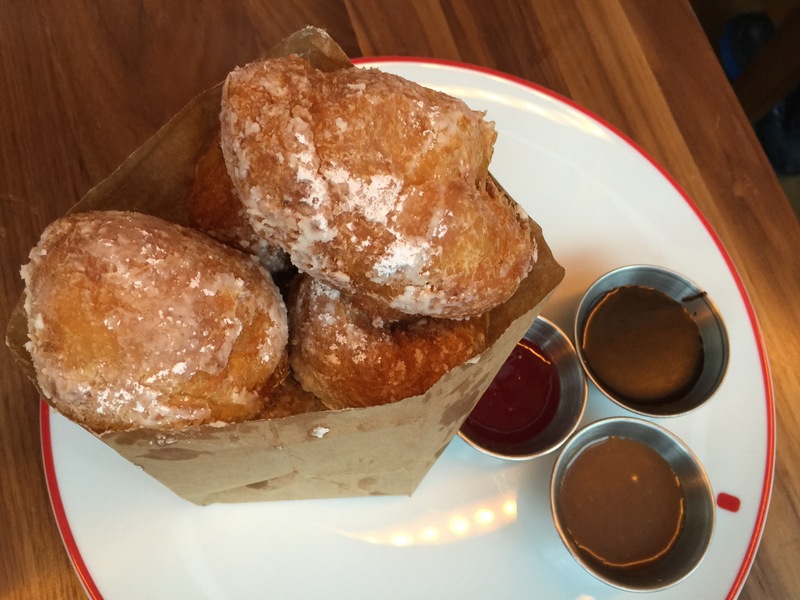 First off, we ordered Uncle Buck’s beignets served with three dipping sauces of raspberry coulis, caramel sauce and semi-sweet chocolate sauce to share. The fried beignets were dusted in powdered sugar and then served out of a brown paper bag, which was a nice touch. The beignets themselves were huge in size, but surprisingly light and airy inside, obviously the dough was perfectly made and fried to just the right touch. Of the three sauces, my husband and I really liked the raspberry coulis as it had just that touch of acidity that balanced out the sweetness of the beignets. In fact, surprisingly the semi-sweet chocolate sauce was my least favorite dipping sauce as it was just too sweet considering all of the powdered sugar on the beignets. But truth be told, the beignets were so delicious on their own that they really didn’t need any dipping sauces. We just gobbled up the beignets and savored their amazing flavor all on their own. We were really stuffed by now, and I mean really stuffed and our second dessert order didn’t seem to be arriving. At this point, we figured it was fine, no need to mention it to the waiter because we were so full anyway, how would we ever finish another dessert, so no harm, no foul if we didn’t get it. Just as we were about to ask the waiter for the check, he showed up with our second dessert, and I think at that point, both my husband and I looked at each other trying to figure out how we’d ever finish this dessert. But, we ordered it and it was here and we had to take one for the team and try to find room to stuff it all away. My dessert selection was the bananas foster milkshake. We only ordered this milkshake because I’d never seen a bananas foster milkshake before, and I am the ultimate lover of anything banana-flavored. This milkshake was made for me and I just couldn’t pass it up. Even though I was so stuffed at this point, I have to say, one sip of this milkshake and I was absolutely in love. When this is described as bananas foster, that’s exactly what this is. I’m not sure I’ve ever tasted a speciality milkshake as good as this one. It tasted exactly like what it should taste like. Bananas foster is not an easy flavor to pull off, and this was made with actual bananas as there were bits of caramelized bananas at the bottom of the milkshake cup. You could taste the subtle hints of nutmeg and cinnamon and it was absolutely amazing. Not too sweet, which was actually quite nice, and the drink was actually made beautifully with the perfect thickness to it. This was one sensational milkshake, and I dare say it may be the best milkshake I’ve ever had in my life. To say that my husband and I were incredibly stuffed by the time we walked out of Founding Farmers was an understatement. Sure, you could say we were starving after having not much of anything to eat all day after having traveled the previous evening. And sure, maybe that factored into some of it, but it was really the food at Founding Farmers that stuffed us to the gills. After having missed out on dining here during our previous trip, we were so happy to have had the opportunity to enjoy a nice evening meal at Founding Farmers during this trip to Washington, D.C. And Founding Farmers did not disappoint in the least. I don’t remember the last time I left a restaurant so full and so satisfied with my meal. Everything we ordered was amazing and delicious, and considering how busy the restaurant was, came out lightning quick. 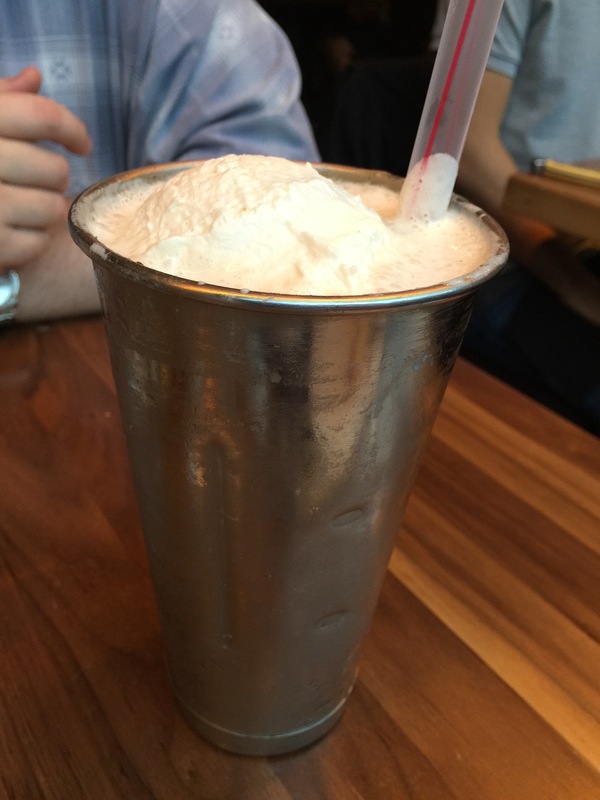 Founding Farmers is a lively space to go to and unwind on a Saturday night in an upbeat, fun atmosphere. The food is the star of the restaurant and the diversity and eclectic dishes on the menu highlight just how fresh the ingredients are and how delicious farm food can really be.